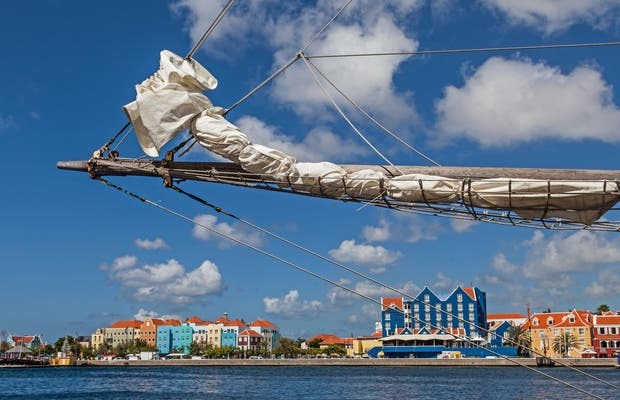 Curaçao's capital, Willemstad, is divided into two towns by the bay of Santa Ana, belonging to the Caribbean Sea. It was named Santa Ana because Christopher Columbus arrived here on July 26, 1499, which is the celebration of the Feast of Santa Ana. The bay forms a channel separating the districts of Punda and Otrabanda . There are two bridges to cross from one side to the other: the first being a concrete traffic bridge, and the other a pedestrian swing bridge known as Queen Emma bridge [/ b], famous for being the only floating wooden swing bridge in the world. I stayed for a week in Curacao and it was really was an unforgettable experience that I'd love to repeat many times. You could even say that one week is too short to take in all the beauty of the island. I'm anxious to go to the Carnival there, as I was told it's very good. I'm planning to spend 15 days over there and enjoy some more of this beautiful island! !